Michael Buble proved he was not only a modern man, but an opened minded one when he began wearing a male version of an engagement ring after he proposed to his Model girlfriend, Luisana Lopilato. Although more men today are embracing the idea of wearing a ring as a symbol of their commitment pre-wedding, most do so for their own reasons. For Buble though, it is a cultural thing. In some South American countries, like Lopilato’s home of Argentina, it is tradition for an engaged couple to exchange rings after a proposal, and Buble famously joked that he had not heard of the tradition before, but went along with. Buble is once again giving a nod to his fiancé’s culture by planning not one but two ceremonies to ensure that both sides of the couple’s families can participate in the festivities. No word on how the style of his wedding ring will differ from the engagement ring he has been wearing for the past year, but modern men are not just varying in tradition these days, but in terms of style as well. The Men’s Collection from Verragio offers a unique and creative approach to men’s bands, and is an alternative to traditional style bands. All rings from the In-Gauge collection are injected with black enamel and sand- blasted to create a blending of textures. The RUD 7906 exemplifies both of the elements used to create a modern and sophisticated wedding ring. The ring features two black enamel lines that the run the length of the edges and strategically placed small Round cut diamonds along the band, and ring’s 7mm width preserves the masculine air of the design that includes a little extra ornamentation. For the purists, Verragio still offers a traditional look with the VW 5006, which features a classic, unadorned band; sand-blasted to create a rougher texture, and is available in yellow gold as well as other white metals like white gold or platinum. Its 5mm width creates an unobtrusive design for a guy who likes to keep things simple. However, Verragio’s VW 6014 offers the best of both worlds with only a mixture of textures used to create a one-of-a-kind look. This ring features alternating smooth and sand-blasted lines that run along the length of the ring and creates the illusion of stacked bands. The black enamel and diamonds that are featured in many of rings in the men’s collection are absent, but still the textured design creates the perfect balance for a today’s modern man who fancies himself as old-fashioned but likes just a little extra flash. 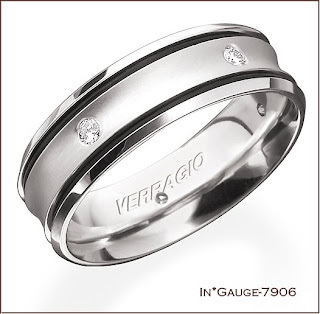 This entry was posted in men's wedding rings, verragio, wedding rings. Bookmark the permalink.